Watching “Cultural Rhythms” was a bit like stepping back into Kindergarten: I, the short, klutzy spectator, was suddenly filled with the uplifting desire to drop my books and become a dancer. During Expressions Dance Company’s performance in the dimmed and lively Sanders Theater on Saturday, I found myself inadvertently tapping my pen to the beat. Nevermind the fact that I lack the graceful swanlike legs of a dancer, can’t count a beat, and have enormous, boat-like feet. “Cultural Rhythms” just does that to you; it makes you want to sing along, to get up and dance, to join the beat. “Cultural Rhythms,” an annual showcase of talent from Harvard’s diverse student groups, featured 28 different performances this Saturday. Every year, the Harvard Foundation for Intercultural and Race Relations, which sponsors the event, chooses an Artist of the Year to honor, as well. 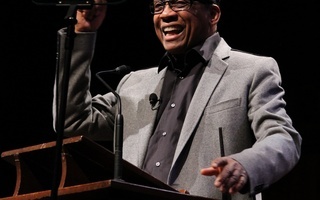 The 2008 recipient—celebrated jazz musician Herbie Hancock—took to the stage with a large smile on his face at the show’s start and hosted the night with ease. The next set of performers, the Irish American Society Dancers, displayed a lively and impressive form of Irish stepdancing. Their bright, flavorful costumes were the first of many beautiful traditional outfits, from the colorful dresses of the Harvard Ballet Folklorico de Aztlan to the bright orange and white worn by Harvard Bhangra. When Mariachi Veritas de Harvard, a traditional Mexican Mariachi band, took to the stage, I couldn’t help but share in the excitement of a fellow bench mate, who inadvertently registered amazement as the male soloist began singing in a surprisingly bass voice. Although the songs were in a foreign language, the emotion in the soloists’ voices enveloped the audience in the universality of music. A similar contagion spread during the performance of the Kuumba Singers, a large-scale choir that explores the musical tradition of African folk songs, spirituals, and gospel. Their performance featured three distinct vocal groups, whose juxtaposed parts harmonized perfectly. 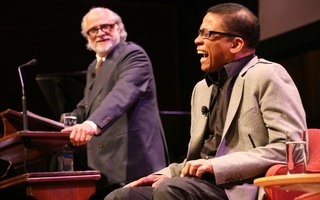 Throughout the evening, Hancock shared a diverse array of personal anecdotes about everything from his wife, whom he met in Asia, to his Irish American roots, “where,” the musician joked, “I got my rhythm from.” Hancock also tried his hand at salsa dancing, Asian fan dancing, and African drumming. The range of ethnic dance and song was further illustrated by Harvard Wushu, whose modern rendition of kung fu became a dance, graceful and delicate despite the members’ giant swords and other weaponry. This play fighting popped up again in the Harvard Breakers performance, whose place in the show reminded us that culture is not simply limited to ethnic groups. The Breakers celebrated hip-hop culture and dance by featuring a combination of three different musical styles, united by a careful choreography of break dancing, popping, and locking. The best part of “Cultural Rhythms,” however, was not a single act by one performance group, but rather the finale, when all the groups came together to share their talent with not only the audience, but each other. Bhangra dancers learned the steps to Mexican traditional folk dances; African and pow-wow dancing occurred side-by-side; and all the groups learned a little bit about popping and locking from the Breakers. Such a finale put a lasting emphasis on the message of the night, “that the real spirit of America is the spirit of the world,” according to Hancock. Harvard is in Cambridge, not Boston, but try convincing Grandpa Bob back in Fancy Gap, Virginia of that. You can't. The jazz musician will deliver six lectures in February and March, joining the ranks of past Norton Professors like T.S. Eliot and Igor Stravinsky.